Best Uses: If you are like me and you like to travel light, then this one is definitely for you. It’s best suited in a small body of water, fishing on lakes, ocean bays, rivers or basically any calm river. 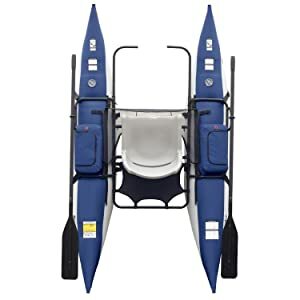 Also, if you are a beginner in the pontoon boating world then this one is a good one for starting out and since it’s not expensive, it makes it perfect for testing the waters. You get adjustable footrests with this one. The footrests adjust to a range of lengths for your comfort. This means that you can ride high so that you experience more visibility which is a really good thing. When you ride high you get to observe any river hazards that may prop up well in advance. Also, the footrests are non-slip. So, this goes without saying that this is a great safety measure. The pontoon boat also comes with an under-seat stripping apron which has a fish ruler that will allow you to enter and exit easily by clipping and unclipping. While enjoying your boating experience, you will need to store some stuff like fishing rods, etc. well, not to worry as the boat comes with a storage platform that is rear-facing, which provides you with extra storage. 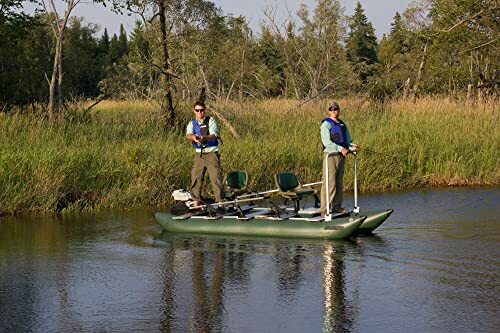 When it comes to construction features, the boat boasts a heavy-duty pontoon with abrasion-resistant PVC bottom and tough nylon tops for durability. Heavy-duty oar locks are included too. The inflatable boat also comes with a powder-coated steel tube frame. 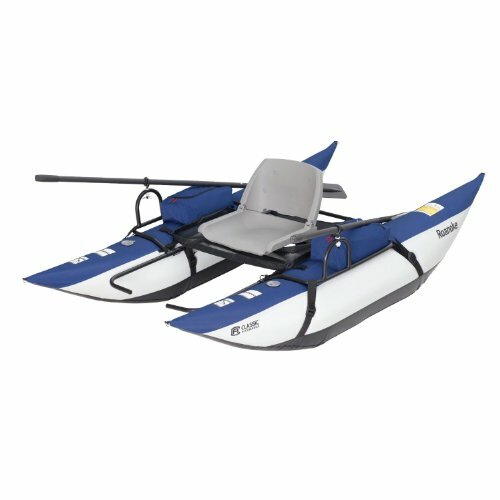 You also get Rugged 6” two-piece aluminum oars cold and heat-resistant bladders and a combination of quick inflation/deflation valves. A 1-year warranty is also part of the package. So, you want to buy a pontoon boat? If you answer is yes then first, there are two important things that you need to consider. That is toughness and stability. I’m proud to say that the Roanoke Inflatable pontoon boat has that covered. As I have listed in the comfort features bit, the Roanoke inflatable pontoon boat has an advantage of offering you a lot of storage space. Who doesn’t need extra storage space? This storage space is found just below the oar locks, where there are two large oversized armrest pockets that have zippers. You can use this to store any small fishing gear that you may have. Also, you can store your cooler box in a mesh platform that’s behind the seat. The inflatable boat also has footrests that are adjustable. With these footrests, you get six different positions that you can adjust them to. When it comes to assembly, it’s very easy as there are no parts to assemble, and you only need 5 minutes to set it up. 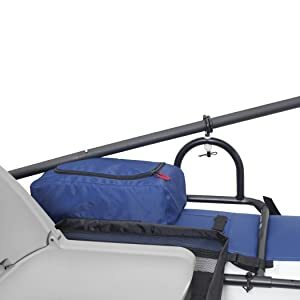 It has a frameless feature that makes it very versatile and one of the easiest pontoon boats to transport anywhere and since it’s inflatable, it’s pretty easy to transport and store. Another advantage is that it has a plastic seat that is slightly higher than normal, which means that you won’t feel like you’re sitting on the water, and in addition, you can easily fold down the seat if you like. When it comes to loading capacity, the boat is able to carry more than 350lb. Pretty roomy. Rowing with this one is easy thanks to the fact that it has oar locks. Having oar locks ensures that if you lose hold over them, they will still stay with you. Sometimes when on the water, your boat may scrape against rocks, puncturing the bladders. 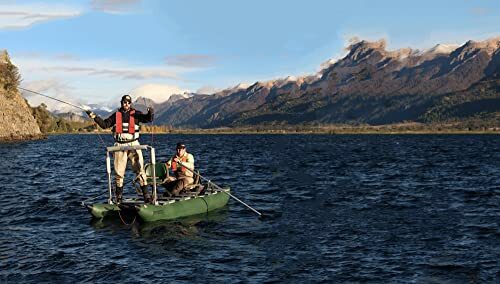 With this particular inflatable pontoon boat, there is minimum chance of it happening, as it’s made with heavy-duty PVC that’s abrasion resistant. Finally, the boat is quite budget friendly! We all know that everyone that has advantages also has disadvantages. So, because of these boats’ lightweight nature, if you come across strong winds, they may make your inflatable pontoon boat unstable. So, this is something that you need to consider. Probably the best thing to do is to avoid going out in the water when there are strong winds. Better safe than sorry, I always say! Also, you may find that the oars may be long and rigid. The Oar locks are a good thing but the problem is that they are not adjustable. The manufacturers have also included oar stoppers which is great but the problem is that they tend to slide out of place. So, they might not be that helpful. Some people may find this seat uncomfortable. You may notice this over time during long days on the water. The inflatable boat doesn’t come with cup holders and also doesn’t include a pump. So, you might have to accessorize with them at an additional cost. 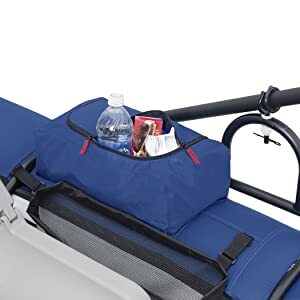 It is equipped with armrest storage which has two large zippered pockets and small mesh stuff pockets that you can use to store whatever you may need to carry on your voyage. It comes with a plastic fold-down seat that is pretty durable and with it, you are able to sit high above the water, so you get to have a better view. You get to enter and exit without unclipping as it has an under seat stripping apron with a fish ruler that helps with this. It has footrests that are non-slip. 6 feet long rugged aluminum oars which make it easier to row. This inflatable pontoon boat is one of the cheapest in the market. It’s a good budget pontoon. If you are keen on affordability and functionality then this one was made for you. In addition, it only weighs 43pounds. It’s easy to transport. It’s very quick to inflate so you can even leave it inflated. Also, it’s good if you’re not sure how much you will use a pontoon and you’d like to just try it out. But you need to remember that it’s not made for strong waters. Finally, it’s not rated for propulsion by a motor as per the manufacturer manual. Best Uses: Are you an angler who likes to get to those hard fishing spots? If your answer is yes, then this is the perfect boat for you. I would recommend you give it some consideration. Canopy to protect yourself against sun, rain and high temperatures. For any angler, comfort is key for a boating experience. This boat takes your comfort into consideration by offering four convenient carry handles, oar locks and oars, a scotty Rod mount system, and a full fabric floor. If you’ve been on any fishing expedition, you would know that space comes in very handy in an inflatable pontoon boat. 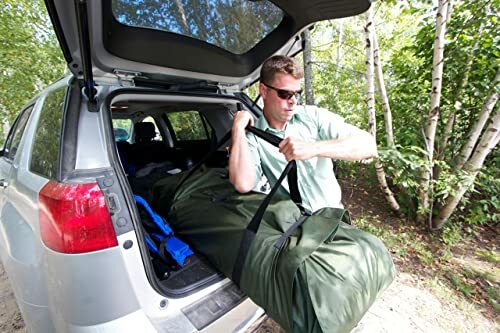 If you have a good amount of space you can carry extra fishing gear if you need to. Also, space is crucial when you need to have an additional person on your fishing trip. The boat comes with two swivel seats for you and your partner in voyage! And if that’s not enough, the swivel seats rotate at 360 degrees to give you comfort as you fish. So, if you want company on your boating expedition, this one is a perfect match. On the other hand, just because the boat comes with two swivel seats, that doesn’t mean that you always have to go into the waters as a pair. If you choose to go out into the water alone, you still can. Well, with this boat you don’t have to as it’s still able to balance well with one angler on board, due to its aluminum cross board floor. You can even stand/ sit on one side of the boat and still be able to balance. That’s how innovative this boat is. The boat weighs 75 pounds and this means that it can support a maximum load of 650 pounds. So, you can carry any extra gear that you may need without any worry of overloading it. The boat comes with full NMMA and CE certification. An aluminum cross board floor which helps to stabilize it and acts as a rigid platform which anglers can stand on or sit on. Underneath that, there is also a full fabric floor that runs the entire length of the boat. Why is a full fabric floor important? Well, apart from supporting electric batteries, lures, tackle boxes, and more, the full fabric floor prevents anything from falling through the slats into the water below. When deflated, the inflatable pontoon boat folds up to just 56” x 21” x 10”. The recommended inflation pressure is 375fc is 3.2 psi. Also, I can tell you for free, that as far as the set up goes, it’s quite user-friendly. It’s also made up of a durable reinforced 1100 Decitex, and it has quadruple overlap seams. The maximum engine capacity is 3HP with a max engine weight of 44pounds. If you are keen on speed, then speeds of 8 mph are possible with a gas motor, and up to 4mph with an electric motor. You get up to 4-rod holders with the boat and these top-quality rod holders mount into pre-drilled holes on two benches. Each rod holder accepts all rods, lock-in ring holds rod safe and secure, rotates 360 degrees. Another important construction feature is that it comes with super strong oars and oar locks. You also get a motor mount for gas and electric motors, the choice is ultimately yours when it comes to preference. The inflatable boat also comes with four conveniently located carry handles. Stability is a crucial feature when it comes to pontoon boats. You don’t want to accidentally topple over in freezing waters in the middle of a river. This inflatable boat is very stable even if you’re riding it alone. It can easily handle the uneven distributed weight without tipping. This is thanks to the aluminum cross board floor, that helps to stabilize the boat by acting as a rigid platform which anglers can stand on or sit on. 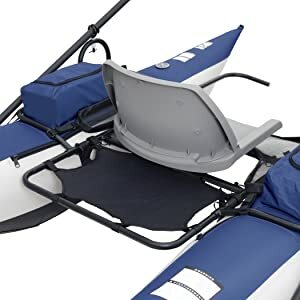 And if that isn’t enough, the inflatable boat comes with two comfortable swivel seats, that can comfortably turn in any direction when fishing. 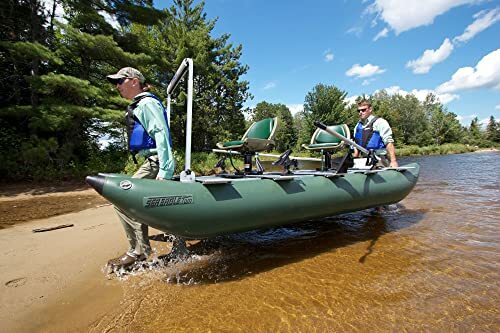 Another thing is that the inflatable boat has a highly customizable design that allows you to add a variety of accessories such as canopy, motor, etc. So, if you’re the type that likes to be able to customize stuff then look no further! This boat was made for you. This boat is as customizable as it can get. Something to note, in case you are going fishing alone, you can always remove one of the swivel seats, and this will translate to more space! So, with one swivel seat out of the way, you have more available space for standing and casting. As an angler, portability is another feature that is key. Well, the good news is that when it comes to portability, this one has it covered. Well, it has an excellent design frame that folds really well, making its transportation pretty easy. The boat is also quite lightweight. For a better view, sitting in an elevated position is highly welcome. The Swivel seats allow for this. As you can use the swivel seat with or without the pedestal for a higher or lower seating position as you prefer. So, you get a good view of the environment as you fish. Speaking of the environment, it comes in a green color that helps it to blend in with the natural surroundings. Set up is also quite user-friendly, all you have to do is simply roll it up and insert four under bars under the aluminum cross boards. Next, inflate the boat and set it up. You can easily be done and in the water in 10minutes, which means you’ll spend less time getting the boat in the water and more time fishing. Its design offers stability as the twin pontoons each have a diameter of 16.5” and are fixed just less than two feet apart – a design that provides an incredibly balanced surface. Meaning that you can stand on the edge and cast and not worry that it will tip you into the water. Even if you stand on one side of the pontoon, you will still be stable enough to stand and cast. The absolute rigidity of the casting surfaces- the aluminum struts provide the hardest and most durable floor of any of sea eagles range of inflatables. 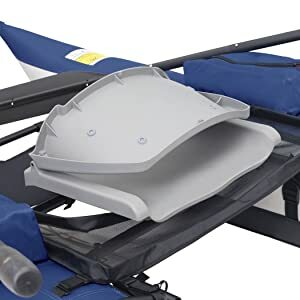 The boat also comes with molded nose cones that add to the boats excellent overall durability. The fabric underfloor conveniently prevents anything from falling through the slats into the water below. It’s also perfect for holding gear, tackle boxes, and even a battery. The full floor ensures that you have more useable space than ordinary pontoon fishing boats and if that’s not enough, it acts as a safety net to catch gear that you may drop. This allows you to carry more fishing gear and supplies. Cool, right? The swivel seats rotate at 360 degrees giving you plenty of back support and generous cushions that make sure you have a comfortable fishing excursion. These swivel seats snap on and off without tools. Last but not least, the inflatable boat comes with a set of printed instructions for your reference. Whether you’re looking for a simple fishing boat or need a fishing platform that allows for a great amount of customization, this is an excellent choice that will serve you well for many years to come. This inflatable boat is built to last a very, very long time. You can use it for solo fishing if you like but it’s better for two. It’s made to carry two adults with a maximum weight of 650lbs. Designed to take you wherever you want to go with the least possible effort- allowing you to fish in comfort and stability. So, if you are one of those adventurous anglers, then this boat is for you. It’s one of the most innovative and best of Sea Eagles boats. Affordable, reliable and unbelievably convenient way to spend a day on the water fishing. Finally, it comes in a new green color that blends pretty well with the water. They take only up to 3 HP gas engines. You can also use up to 74 lb. thrust electric motors.